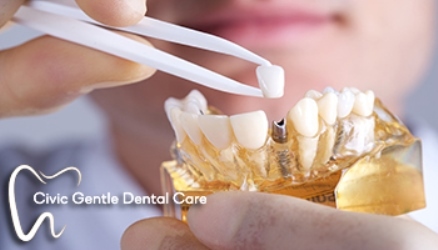 Call Us Today: 8090 1107 or (02) 6247 0224 or e-mail info@civicgentledentalcare.com.au or visit us at Suite 8, Lvl 3, 161 London Circuit, Canberra City ACT 2601. We offer a competitive rate for our Basic Dental Implant package* at $3495. This price includes most of the procedure, including scans, implant surgery and the implant crown itself. Advice on the implant system and implant crown material required for your specific case will be available upon consultation. Royal Australian Mint going to Civic Gentle Dental Care takes about 9 minutes to drive. Head north and turn left onto Denison St then another left onto Kent St. Continue onto Novar St and at the roundabout, take the 3rd exit onto the Adelaide Ave ramp then merge onto Adelaide Ave. Keep right at the fork to continue toward Capital Cir/A23 and keep right at the fork, follow signs for City Center/A23/Tourist Drive 5 then continue onto Capital Cir/A23. Finally, at Vernon Cir, take the 1st exit onto Northbourne Ave/A23 and turn right onto London Circuit. Our dentistry is located on the left side.